After relaxing for 2 days on the island of Mook and Kradan, we venture towards the famous Phi Phi islands. The Phi Phi Islands are a small archipelago in the Andaman Sea, belonging to the Thai province of Krabi in the south of the country. The archipelago consists of two main islands (Phi Phi Don and Phi Phi Leh), the most diverse of the smaller islands and islets. Koh Phi Phi was devastated by the tsunami in December 2004, when almost all the island's infrastructures were destroyed. The island is nowadays invaded by hundreds of tourists who contribute to a local economic growth. But returning to our trip to Phi Phi island: we buy a ferry ticket at one of the many local agencies on Mook Island. We take the boat from Charlie beach at 12:30 pm and arrive at Koh Lanta at 2 pm where we change the boat. We get on a real ferry where there is even wifi and the staff also distributes a bottle of water. We arrive at the port of the island Phi Phi Don at 2.30 pm. We head to the hostel booked on Booking.com but, once there, we are informed about the fact that the structure is closed due to a fire that spilled nearby the night before (6 February). 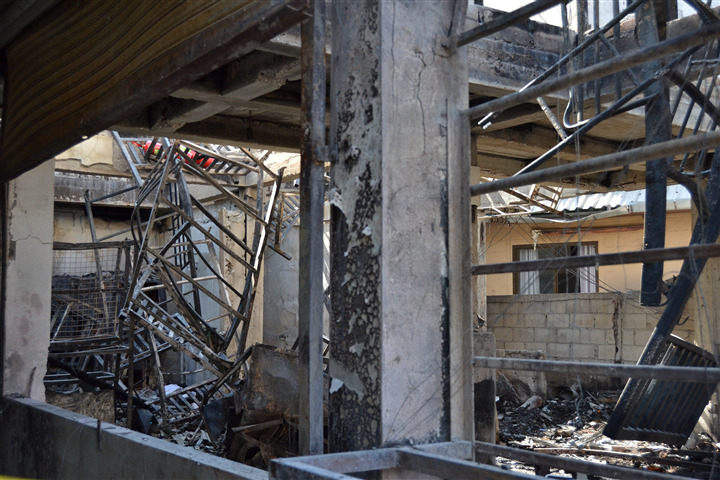 In fact, there was a gas leak at the restaurant "Garlic 1992" which caused a great fire, destroying several neighboring rooms and causing electric and water faults. There were no deaths but there were many inconveniences for many tourists, most of them young people staying in hostels in this area. However, they are already trying to have everything fixed in few days. Therefore we have to look for another hostel. It did not take long for the huge amount of accommodation in the center. We, hence, stay at the "Paradise dorm" for 300 THB per night, almost € 8. You cannot really call it a hostel. In fact, it consists only of two rooms with 16 beds each, with air conditioning and 4 bathrooms with an internal shower. The location is great for those who want to party because, just outside, there is loud music at least until 2.30 am every night. After lunch, we walk for about half an hour towards the viewpoint where we can admire the sunset. It's a good workout because it's all uphill, but beware of mosquitoes! Once at the entrance, we have to pay 30 THB for the view as we are on private property. From here we enjoy a very nice view of the bay below, although there are many people and the atmosphere is not the one we imagined. As soon as the sun hides behind the mountains, we begin the descent and, once back in the center, we are curious to know this island by night, given its reputation for the lively nightlife. Right next to our hostel, in fact, there are various places with music at the highest volume. We buy something to drink in a supermarket and sit on a bench watching people walking and drinking strange cocktails in a sort of buckets. Right here we meet 3 Argentine boys, Marco, Pino and Enrique, who become our friends for these days. We walk towards the beach "Loh Dalum Bay" with several bar/disco. Each bar has its own music and shows with fire. The local guys also organize various games such as the jump or the limbo to attract more people, then distributing free shots. In short, nothing bad if you want to have fun and dance on the beach. The next day we decide to explore the beautiful beaches of the island. We follow a path starting from Ton Sai Bay beach, where there is the port, and after about half an hour we reach "Phi Phi Bayview Resort" where there is a very nice beach where we refresh and rest for a while. Then we continue on the path to reach the "Viking Resort". After a while, we find ourselves on the beautiful Long Beach. Here we find crystal clear but slightly deeper water. The color of the sea of this island never stops to amaze us. Here there are also several resorts with sea view bungalows and private gardens. Really a fairy tale! Just before sunset, we return to the center of Tonsai where we eat one of our favorite dishes here in Thailand: noodles with chicken and eggs, here called Pad Thai, for 80 THB - 1.80 €. The next morning we rent a private boat to visit the most beautiful beaches. We pay 1300 THB - 34 € for 2 hours. We start from the port and head towards the island Phi Phi Leh to see the famous Maya Beach that in 1999 hosted the set of the movie “The Beach” with Leonardo Di Caprio. These white sandy beaches are a daily berth for numerous tourist boats. We arrive at 7.30 am with the hope of finding fewer people. But even at this time, there are already several boats. We do not stop to swim in this beach because the entrance to the park costs 400 THB. Or an all-day tour: departure at 10.30 am and returns at 6:30 om. The latter, unlike other tours, also includes a visit to 2 islands to the north: the Mosquito and Bamboo’s islands. (Price 650 THB). We personally do not want to spend all day on the boat given the rough seas. Therefore we exclude the all day tour and opt for a taxi boat that is a private boat that allows us to stop wherever and whenever we want. But, continuing with the stops of our tour to Phi Phi Lee: we stop first at Lohsaman Bay where the coral reef is located so it is ideal for snorkelling; then we stop at Phi-leh bay, a small bay with turquoise water; then continue to the quarry of the Vikings, whose vaults are decorated with ancient paintings and where the locals skilfully climb massive bamboo ladders to collect the main ingredient of the bird's egg soup, a typical local dish. We make one last stop at Monkey beach. 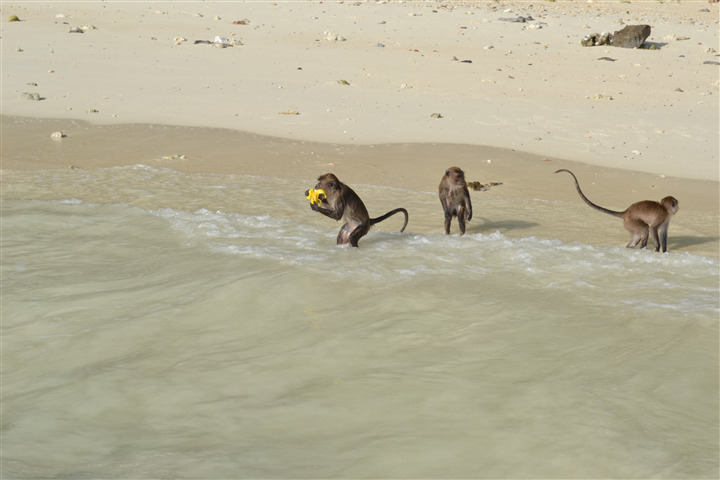 As soon as we land on the beach, dozens of monkeys start to meet us in search of food. We are also witnessing some rather violent scenes of tourists trying to give them bananas, and monkeys attack people quite aggressively. We return to the port at 10 am and we walk towards a beach to the northwest: Loh Lana. After an hour and a half of trekking, characterized by climbs and descents (and a great slip of Sonia), we reach this beach 500 meters long. The shallow waters of the bay offer great snorkelling opportunities at both ends of the beach. Great place if you want to get away from too many tourists on this island. We stay here all afternoon because it is truly a paradise: crystal clear water, total silence and nap in the shade of some tree on the beach. In the late afternoon, we come back to the port of Ton Sai with a taxi boat that we share with a Ukrainian couple paying 300 THB - almost € 8 per couple. Not a very cheap price but we are a bit lazy after all this relaxation and we do not really want to do again the trek to return. We have dinner with rice, veal, vegetables and eggs for 70 THB - 1.80 €. We continue the evening “partying” on the beach with our Argentine friends sipping a beer. In short, these islands offer beaches with crystal clear sea and rich marine life. It is certainly a very tourist destination, but we must admit that it was worth spending a couple of days here because the wild nature and the fairy-tale sea undoubtedly make it masters!